Buttercream: The Icing On Our Delicious Cake Experiment! I make one heck of a delicious buttercream frosting. Only problem is that it isn’t technically buttercream because I don’t use eggs. If you are a real baker, you might recognize my frosting as a delicious abomination called “American Buttercream”. If you’re good, I’ll give you the recipe at the end of this blog. If you are just checking in for the first time with this series… Hi! We are making a geode cake. You might want to read parts ONE and TWO to catch up! At its heart, real buttercream frosting is an emulsion. You are combining a fat and a liquid. The fat is the butter, and the liquid is the egg whites. Before you do anything else, take a pound butter out of the fridge and let it soften up. To make a real buttercream, you start by whipping about a half dozen egg whites to a fluffly foam in an extremely clean, dry bowl. Chilling the bowl doesn’t hurt. If you have a stand mixer, this part goes much better, but a hand mixer will do in a pinch. A whisk frankly will just break your spirit. Next you slowly add about 1 cup of granulated sugar to the mix a little bit at a time. DO NOT use powdered sugar. Powdered sugar has a little bit of cornstarch in it which will prevent the egg whites from properly making bubbles. Once all the sugar is added, turn up the speed on your mixer. As you add the sugar, it should turn the foam into silky, shiny, lovely, stiff peaks. What’s a stiff peak? Jab a spatula into your mix and pull it out. If you can turn the spatula over and the mix on the end of the spatula doesn’t droop, you’ve got a stiff peak. Next, start adding the butter into the mix about a tablespoon at a time as you run the mixer at a low speed. Because you are adding a lumpy thick fat to your fluffy bubbles, your mix will get weird. You haven’t broken anything. You are doing it right. Add about three sticks of butter, but you should have softened four in case you need a tish more. If you don’t end up using it, make toast. You know what….? Make cinnamon toast. You deserve it. Once you have all the butter bits in the mix, turn up the speed to high and mix for approximately ever. Or about 10 minutes, whatever comes first. The mixer will actually start to sound sad because it is working hard to satisfy your buttercream needs. When it gets to this point, taste it and see what you think. You may want to add a little bit of flavoring extract. If you are following along with the blog, at this point you should have your cake rounds made and you can now frost them. If you aren’t ready for that, you can also store your buttercream in the fridge for a couple weeks. When you want to use it, you’ll need to let the buttercream come back up to room temperature. Assuming you are ready to frost, here’s what I do: As a base, I get those round circles that bakers use to put your cake, but you can use a plate or whatever you want. Using a spatula, I schmear a little bit of frosting on the base before setting the first round on it. It seems to help things from slipping around. So, schmear and then stick. Author: LeAnn Johnson. Source: Pinterest. Before you add the second round, add frosting to the top of the first. This is a bit of a trick. You want enough that it solidly covers the round, so much so that it might squish out the sides, but not soooooo much that it squishes too much. I also pay particular attention to making sure that the frosting isn’t domed in the middle so that the next round gets weirdly deformed as you put it on. 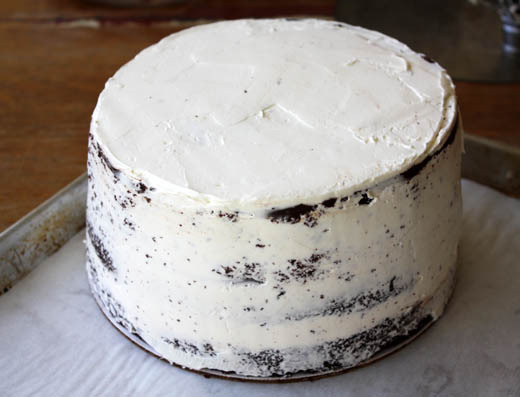 Once you get all your cake rounds layered onto your base, take the extra frosting that squished out in between and coat the outside of the layered rounds. DO NOT ADD ANY EXTRA FROSTING AT THIS POINT. There will be crumbs and weird all over the place. That is okay. Spread the squished frosting pretty thin and cover as much of the cake as you can. 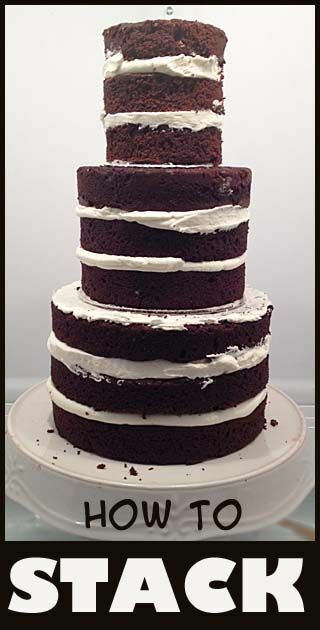 If you are unable to cover the entire cake, CLEAN YOUR KNIFE OFF before sticking it back in the frosting and get enough of a wad to finish covering the cake in that thin layer. When you are done, stick the whole shebang in the fridge for an hour or so. Congrats! You just made a crumb coat. The cake is absolutely going to make crumbs, it just can’t help itself, but the crumb coat keeps them from showing on your finished product. If you are making a multi-tiered cake, you will want to frost all the rounds of one size together but not stack them yet. Basically, you will make three cakes of three different sizes. The stacking comes later. Once the crumb cake is nice and cold, take the rest of the frosting and frost the cake. I have a turntable and an offset frosting spatula for this part. I got both as gifts and MAN did they up my cake game. If you are a baker and you don’t have one, consider them. The frosting spatula helps spread the frosting evenly over the surface of the cake and the turn table helps keep your movements smooth. 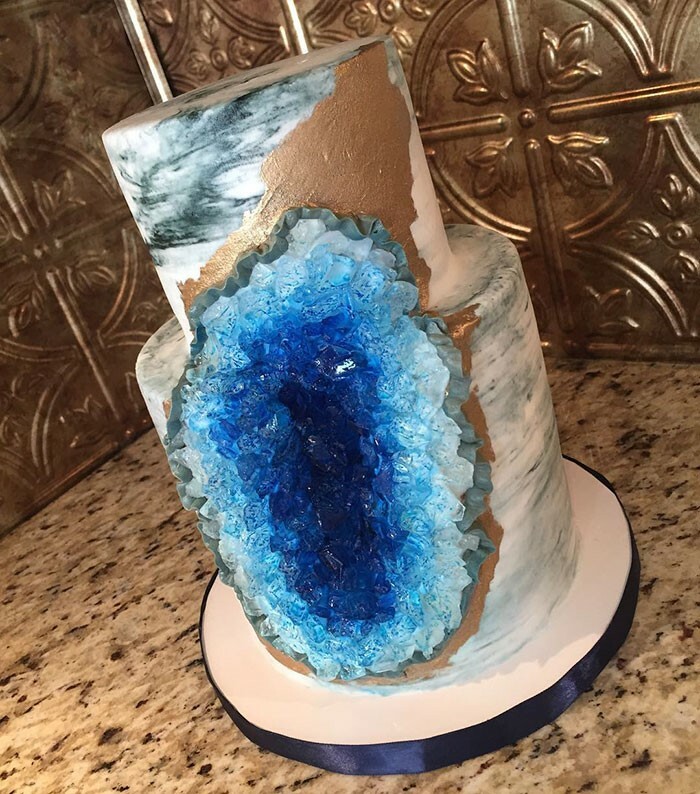 If you are making the geode cake from the intro blog, then you will want the frosting to be as smooth and even as possible. There are a number of techniques here but mostly it comes down to patience and finesse if you are just starting out. The first cake I frosted to be perfectly smooth probably took me 90 minutes AFTER the crumb coat. Since we are going to put a layer of fondant on next, you don’t need to be super smooth, just smooth-ish. Put everything back in the fridge for now. It’s time to work on the fondant, which we will cover in the next blog. At this point, you totally forgot about my very own cheaters version of buttercream. But I am going to tell you anyway. Because I like you. Soften one box of salted butter. Once it is salted, whip it with a mixer. Slowly add a whooooole sack of powdered sugar. The frosting will get a little gross at this point because you need to add a little liquid. I’ve added all sorts of stuff like caramel, coffee, fruit juice, and so on, but the standard go-to is heavy whipping cream. Like a cup of it. You want the frosting to have soft peaks (like stiff peaks but the tips fold over). This makes a DELICIOUS frosting that will make anyone who tastes it both marvelously happy and a little sad for their arteries. Previous Post Tales From Tanzania Revisited! The Science Behind Baking, Part 2! Spectrum of Birthdays: HMNS Celebrates in Any Tradition!